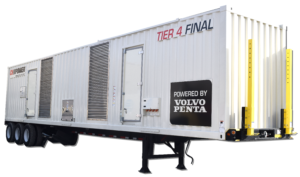 At the beginning of the Tier 4 transition, our engineering team had the opportunity to work with different customers in different markets to design and develop a line of high-power Tier 4 Final containerized generators. Years of use in the rental, oil and gas, mining and other heavy-duty industries have tested the reliability, usability and durability of our containerized generators. Our primary design challenges in developing this line of containerized generators were usability, reliability and functionality for the end user. That’s why we intentionally made these units easily configurable to the needs of any application, from rental to disaster relief to mining — with a whole host of value-added standard features, options and customization. Our Tier 4 containerized generators are high-powered —500 kW to 1250 kW— units packaged in 30-foot or 48-foot ISO containers. The larger footprint of these units allows for more versatility from a manufacturing specification standpoint — we can easily equip your gen set with greater levels of sound attenuation, a larger storage area, bigger fuel tanks or any other value-added features your application demands. Sound attenuation of at least 75 dB(A) heard at 7 meters or 23 feet. Stricter acoustical ratings can be achieved upon request. External fuel, oil, coolant and diesel exhaust fluid (DEF) supply and return to make re-supplying the unit easier. Four access doors — and we can customize the unit with more doors if required by the application. LED interior lighting for ease of access and maintenance. Access ladder integrated into the ISO container. External emergency stop button for enhanced safety. 10% overload capacity on rated power output of the unit. Optional sand traps and filters for dusty environments. Option to customize ISO containers to requirements of your application. Optional CAMLOCK or LUG distribution. Optional KIM hot-start circulating block heater. Optional RACOR fuel / water separator. Optional convenience auxiliary receptacles. Optional battery disconnect. And many more options available upon request. Our Tier 4 solution is simple — and versatile enough that the entire kW spectrum of this line is powered by the same solution. This not only ensures consistent efficiency and quality across your fleet, but it also streamlines service and maintenance needs. Our Tier 4 solution runs off advanced combustion technology that naturally produces less particulate matter (PM). Selective catalytic reduction (SCR) converts nearly all nitrogen oxides (NOx) into carbon dioxide and water. Light exhaust gas re-circulation (EGR) optimizes combustion temperatures and further reduces NOx emissions. And a diesel particulate filter (DPF) removes most remaining PM out of the exhaust. We rely on a dual pack configuration to achieve the kW outputs on the higher end of our containerized line. Simply put, dual packs are two parallel generators in one ISO container: Two 500 kW generators could be paralleled to achieve a 1000 kW output, or two 625 kW generators to achieve 1250 kW. This dual configuration increases the longevity of the overall unit by preventing the effects of light loading. One generator can shut off when the set is run at too low a load. And depending on the kW need for certain applications, dual packs can also offer backup redundancy. 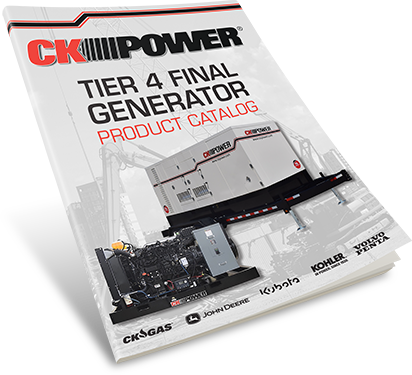 To learn more about our lines of generators, engines and other compliant power solutions, fill out the form below and download our Tier 4 Final product catalog. If you don’t see what you need, give us a call. We’ve long had a reputation as a provider of never-before-seen power products — and will offer you all the engineering and manufacturing support you need to customize your generator exactly to your specifications.